Don't You Feel Awkward Asking Clients for Referrals When You Know the Question Is About You Instead of Them? But What If You Could Do It in Such a Way That You Were Actually Rendering an Important Service About Pre-Retirement Planning to People They Know Who May Really Need Help? Card asks "Do you know anyone with these birthdays?" The reason I want you to know about the Key Birthdays postcard is that many advisors have difficulty finding a simple, elegant way to put the referral message in front of clients. We all know the critical role referrals play in building a profitable, growing business. But agreement about how best to promote referrals is a different matter. And still others float around between those poles and believe you need to ask for referrals when the time is right (which often means never but that's another story). The Key Birthdays postcard is a blended approach. As you'll see below, it explicitly raises the referral question but in a highly strategic way that delivers benefits to all people involved. Sending clients and prospects the Key Birthdays postcard helps you put the referral topic in front of clients and prospects. The postcard leads with a simple question: Do you know someone celebrating any of these milestones? Then it proceeds to list nine important dates and explain the important investment, planning and tax issues associated with that date. The postcard, which includes your photo, logo and contact info, is delivering a tidy, valuable taste of your expertise to clients and prospects. By simply making the Key Birthdays message available to your network of clients and prospects, your actions support and reinforce your role as a financial professional offering important advice and insight to clients and prospects. The Key Birthdays message emphasizes your stature as the professional offering important advice and insights. The questions raised by the Key Birthdays postcard position you perfectly for offering prospects a second opinion about their pre-retirement planning activities. As the card says: "We're always happy to talk with anyone you know about these important birth dates. Certain milestones present special tax and investment questions to consider. Just let us know." And on the back, the card says: "Second opinion needed? We're always happy to offer our investment expertise in a complimentary review of anyone's portfolio. Just contact us." 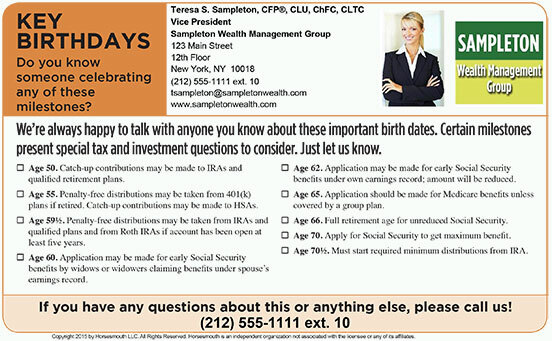 The Key Birthdays postcard raises important questions for people getting ready for their "retirement years." The Key Birthdays postcard is an ideal client touch with a lot of potential. As you can see, the Key Birthdays postcard simply and clearly asks people if they know anyone crossing these landmark birth dates. Remember, as you review the Key Birthdays, recall the types of mistakes you've seen people make over the years around this issues. Sometimes the missed deadlines or wrong filing decisions can cost you up to thousands of dollars. These birth dates raise important questions. They offer the chance for people to call you with a question. That type of interaction gives you the chance to meet someone and offer a second opinion on that person's existing investment portfolio. That's just what you need. A clear, simple opening to show someone the kind of value you deliver to your interactions with clients. And that's the key point. The fact that it naturally positions you for a referral is gravy. So you're delivering a valuable service to anyone whose birthday matches any of the years in the Key Birthdays postcard. I invite you now to take a closer look at the sample below by clicking the image or this link. Click here to see a sample of the Postcard. Because it's a "meaningful" touch. The key birth dates represent serious issues investors (clients and prospects) need to heed. Missing these dates often means lost opportunity costs at a minimum. Because it supports your referral message in a subtle manner. Postcard asks "Do you know anyone with these birth dates?" Because it demonstrates your commitment to keeping clients and prospects abreast of important financial planning issues. Because it strengthens your client communication program. When clients see the postcard in the mail, it's a chance for them to reflect on its message and your thoughtfulness in sharing it with them. Because it positions you well with prospects in the pre-retirement mode. The birthday milestones are critical in getting ready for retirement. Because it's an easy campaign. Just customize the postcard and mail to your list. Because it's a perfect handout. Share with clients and prospects at meetings, workshops and other events where you need or want personalized material to share with others. It's really easy to get started with the Key Birthdays postcard. Just click this link to start the personalization process. You'll add your photo, logo and contact info and then review how the postcard will look. Once you're happy, just complete your order. We'll review it here at Horsesmouth and then release it to the printer. You'll have your Key Birthdays postcard order at your office within 10 business days. Key Birthdays 2014 — Promote referrals. Reinforce expertise. Get people calling. Card size: 8.5"x 5.5" postcard stock. Hard copies: $0.73 to $1.27 each depending on volume. See chart below. Promote referrals. Reinforce expertise. Get people calling. When all is said and done, the advisor whose business keeps growing is the one who keeps communicating with clients and prospects. This is a central tenant of Horsesmouth's Advisor/Client program (where the Key Birthdays postcard was first developed). The Key Birthdays postcard is an easy, simple-to-implement tactic for you. But it delivers strategic benefits. It shows you care. It shows you're thinking and looking out for your clients. It positions you to help people your clients know. You can't ask for much more when it comes to reaching out to clients with important, insightful information like the Key Birthdays postcard. Go ahead now and order a few hundred. That way you'll have enough to send your clients and share with prospects.